"Primogenitor: noun: an ancestor, especially the earliest ancestor of a people; a progenitor." It seems that in the run up to the Christmas holidays, otherwise known as Advent (especially for those of us who are fortunate enough to have a chocolate filled Advent Calendar! ), those good folks at Games Workshop are releasing something every day, either a novel or audio book/drama. What a great idea! But as you can tell from the last posting, it's caught me out a little and I'm just as surprised as anyone as to what's becoming available. The audio drama Perpetual was my first and another was released today, The Calculus of Battle; but more of that anon, because in addition to these Advent releases, regular 'main range' stories are also appearing and for me, Fabius Bile Primogenitor by Josh Reynolds is a very exciting prospect indeed and I'm listening to it now, for the first time, as I write. He is known by many names - Clonelord, Manflayer, Primogenitor. He is the epitome of deceit and perversion, and feared by man and monster alike. 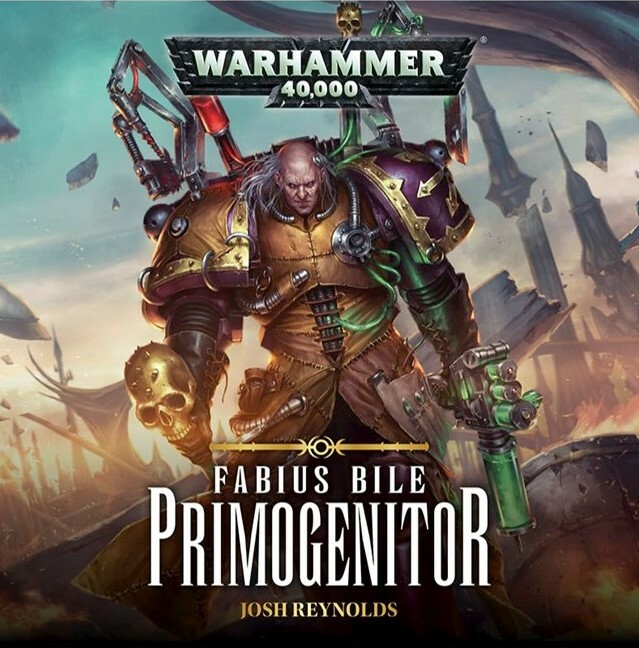 Once the Chief Apothecary of the Emperor's Children, the madman known as Fabius Bile possesses a knowledge of genetic manipulation second to none. Now a renegade among renegades, he is loathed by those he once called brother, and even the most degraded of Chaos Space Marines fear his name. Exiled for his dark experiments, Bile has retreated deep into the Eye of Terror, leaving a trail of twisted abominations in his wake. But when a former student brings word of the ultimate prize for the taking, Bile is unable to resist being drawn once more into the cauldron of war. For in seizing this prize, Fabius Bile might yet discover the one secret his has been unable to unlock... the secret which will prevent his inevitable doom. I thoroughly enjoyed working on this recording and had a great time up at Games Workshop HQ. I also have a particular reason to look forward to listening to this story, which I might mention in a future posting; how mysterious! And while that is still the case, the wait for the next posting won't be very long; in fact, it will be appearing here tomorrow! I spoil you I know, but hey, it's Christmas!